Mother of a 27- year- old of the bride has written a brutal letter about the maid of honor. 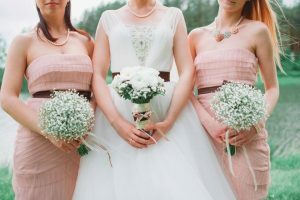 A mother of a 27-year-old daughter wrote a shocking letter to the maid of honor of her daughter asking her not be her bridesmaid. The letter started off with a decent note and later went overboard with brutality. The mother mentioned how the maid of honor is just like a daughter to her but she cannot let her be the maid of honor. The daughter and her maid of honor, Katie have been friends since the age of four and used to spend almost the entire day at her home. According to the mother, Kate will most likely ruin the wedding. But why? Her daughter had already decided that Katie was to be the maid of honor but despite their closeness, the mum had a problem with Katie having a big part to play in the wedding. According to the mother Katie would ruin the aesthetic of the wedding ceremony. She said, ” The problem is that Katie walks with a pretty severe limp due to a birth defect. She has no problem wearing high heels and has already been fitted for the dress, but I still think it will look unsightly if she’s in the wedding procession limping ahead of my daughter.” The mum then added that Katie could instead greet the guests or maybe take a video, hand out gifts so she doesn’t ruin the aesthetics of the wedding. Unsurprisingly the mother then revealed that her daughter is no longer speaking to her. Another Twitter user tweeted: “This cannot be real. It just. Can’t.” There were more people who joined hands in the comments. There was one who wrote, “My favourite part is that she said Katie was ‘like a daughter to me,’ b/c apparently, to her, that means ‘not that close and I’m mean to her.” What do you have to say?